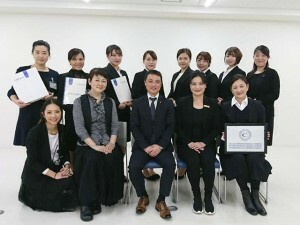 Second year students in the Total Beauty Department’s Esthetique Course at Tokyo Belle epoque College of Beauty took the examination for the CIDESCO international qualification (Beauty Therapy Diploma recognized by CIDESCO) on February 26 and 27. This year an examiner from China came to the school and conducted examinations for two days from February 26 to 27. The first day was the practical examination, which consisted of the facial examination and the body examination. Students need to come up with a treatment after listening to the client’s concerns and conducting a skin analysis. The examination is challenging for students as they must consider and carry out the needed course of treatment immediately. The second day of the examination is the written examination, which tests students’ grasp of esthetic-related theory. The written examination consists of 100 multiple choice questions from all parts of the CIDESCO Theoretical Training Programme. If students do not know the answer to a question, they need to comprehend the question without just leaving the question blank.